M82 is a so-called starburst galaxy where stars are forming much more frequently than normal galaxies. This new deep Chandra image reveals hundreds of point-like X-ray sources, some of which likely contain black holes. Supernova explosions have produced bubbles of hot gas that extend millions of light years away from the plane of the galaxy. 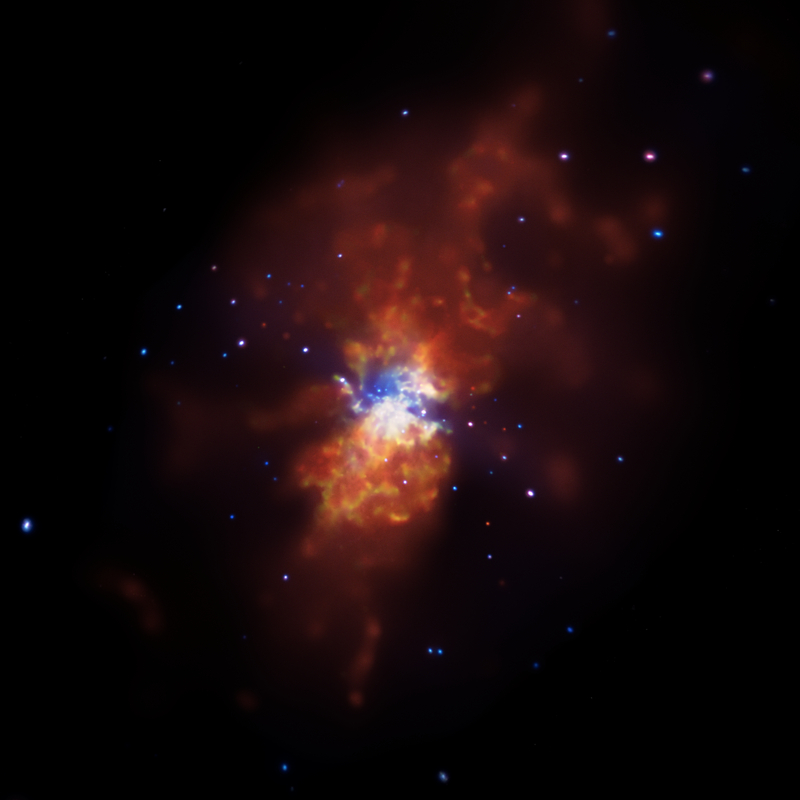 A new Chandra X-ray Observatory image of Messier 82, or M82, shows the result of star formation on overdrive. M82 is located about 12 million light years from Earth and is the nearest place to us where the conditions are similar to those when the Universe was much younger with lots of stars forming. M82 is a so-called starburst galaxy, where stars are forming at rates that are tens or even hundreds of times higher than in a normal galaxy. The burst of star birth may be caused by a close encounter or collision with another galaxy, which sends shock waves rushing through the galaxy. In the case of M82, astronomers think that a brush with its neighbor galaxy M81 millions of years ago set off this torrent of star formation. M82 is seen nearly edge-on with its disk crossing from about 10 o'clock to about 4 o'clock in this image from Chandra (where low, medium, and high-energy X-rays are colored red, green, and blue respectively.) Among the 104 point-like X-ray sources in the image, eight so far have been observed to be very bright in X-rays and undergo clear changes in brightness over periods of weeks and years. This means they are excellent candidates to be black holes pulling material from companion stars that are much more massive than the Sun. Only a handful of such binary systems are known in the Local Group of galaxies containing the Milky Way and M31. Chandra observations are also important in understanding the rapid rate at which supernovas explode in starburst galaxies like M82. When the shock waves travel through the galaxy, they push on giant clouds of gas and dust, which causes them to collapse and form massive stars. These stars, in turn, use up their fuel quickly and explode as supernovas. These supernovas produce expanding bubbles of multimillion-degree gas that extend for millions light years away from the galaxy's disk. These bubbles are seen as the large red areas to the upper right and lower left of the image. Could this be the endless formation of galaxies that continues our world as we know it. We have always wondered were the start of the cosmos is, maybe this is it. I am so impressed with what NASA discovered. I mean I really like Starburst galaxies also when Wavelengths change it gives a lot of beauty, so thanks a lot Chandra, for showing us how wonderful is the universe. Absolute display of value from NASA and other institutions which should have funding protected from political expediency. Below the photo at the top of the post click on "How is it made" and this explains how the composite image is put together and what the colors represent, etc. This is amazing. Can someone let me know how the colors are arrived at? I think I can somehow comprehend the image, but not the colors. A beautiful, interesting, and highly educational post and photo. A lot of things happening in that galaxy to ponder on, so much is happening in this galaxy, island universe as they used to be called. There is so much to learn. Wonderful image. There must be no end to what is beyond this image that can't be seen. NASA may have to go further in space to really see what lies beyond the images they now see. There has to be more, I don't think there is an end, it must go on and on out there. There has to be life elsewhere. A starburst galaxy 12 million light years Earth. 12 million light years from Earth. Low energy red, Medium energy green and High energy blue. In the constellation Ursa Major in Northern Hemisphere.